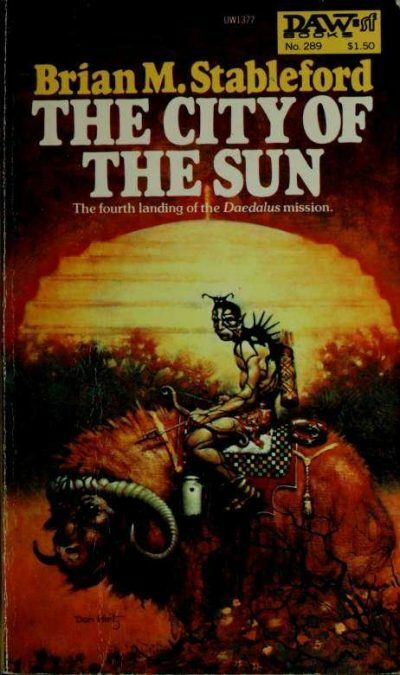 1978’s The City of the Sun is the fourth novel in Brian M. Stableford’s Daedalus Mission series. Earth’s first expedition to recontact its abandoned colonies found only empty worlds, worlds where colonists had been overwhelmed by local conditions. The Daedalus Mission is the second expedition, sent out to assist colonies when possible and to determine the reason for the colony’s demise if defunct. Thus far the crew of the Daedalus (Nathan, Linda, Conrad, Karen, Pete, Mariel and Alex) have found two surviving (if odd) colonies and one world where humans were horribly transformed by unforeseen local conditions. As far as they can tell from orbit, Arcadia seems to have failed utterly. Then the expedition spots one lone city. From orbit, the city’s architecture seems to draw inspiration from Tommaso Campanella’s 17th century Utopian work, The City of the Sun. Several miles across, the city is a monumental undertaking. Far from being a failed colony, the Arcadians seem to have thrived, judging by their ability to create such an impressive edifice in just a century. This raises the question of why humans are limited to one specific region on Arcadia. The first encounter with the Arcadians raises far more pressing questions. The scouts who encounter the Daedalus are distant, curiously aloof towards the Earthlings. The Arcadians warn their visitors not to approach the city just yet. It seems the Ego and the Self must be informed that off-worlders have arrived. The significance of the terms Ego and Self in this context is not explained. If that was not odd enough, each of the Arcadians is covered with an odd black web. It’s as if they’ve been tattooed … or something is growing on them. If it is a growth, it’s not clear what significance, if any, it might have. Could this be a benign adaptation to a new world? A colonist-engineered adaptation? Or might it be a parasitic infection? If this is something that should be cured, the Daedalus crew might be able to help. Further contact reveals that the Arcadians are a curiously coordinated, peaceful lot. Discord seems unknown. The city does have specialized castes, but all appear to be treated equitably and everyone seems happy with their lot. Impressive but also not exactly what one expects from humans. Ship’s telepath Mariel reports that the Arcadian minds do not feel entirely human to her. Further investigation reveals that humans and alien protozoans have developed a symbiotic relationship unlike anything seen elsewhere. In a sense, all of the Arcadian humans share one mind and a form of immortality. Can Earth take the risk of allowing the Arcadians to survive? Can the Arcadians take the risk of allowing the Daedalus to leave? Is there a way that this first contact between humans and post-humans can avoid tragedy? Biologist Stableford makes creative decisions here that both pleased and annoyed me. Pleased: he realizes that even the most Earth-like worlds will be inimical to human life: small communities without support might die out. Too much science fiction assumes quickly habitable worlds. This book is a fair example of morosely competent British SF of the post-Imperial era, when things were not as they once were and there was no particular reason to think they’d get better (at least from the perspective of a Brit). Earth a few centuries hence is poor and desperate. Its first attempt at spreading to the stars stalled for a century and it is in no way clear a second will follow. It’s a gray and melancholy world. This is a short novel (189 pages in mass market paperback). There isn’t much room for any of the characters to be developed in depth. Still, one gets a pretty clear idea of the relationships between characters and what their positions on various questions will be. Leader Nathan, for example, is more likely to prioritize the safety of the mission and of Earth, whereas Alex has the sort of curiosity one likes to see in protagonists (if memory serves, Alex makes a hobby of being kidnapped by colonists in large part because he’s the easiest one to entice into a trap). Usually a SF puzzle story or novel ends once the protagonists have worked out what was going on. Solutions are left to the handwaving. The City of the Sun takes another tack: it solves the puzzle, then spends much of the book on discussion of how to react to what has been learned. I found that an interesting change of pace. The City of the Sun is available here (Amazon) and here (Chapters-Indigo).